Do you remember the world(s) you created in your childhood bedroom? I had a play kitchen that was my own kitchen in my own house. I made my mother knock before entering my “house” for a while. During my parent’s divorce, I once arranged my blankets into a big nest, like Big Bird had on Sesame Street. Then there was the period when I categorized my stuffed animals according to species. Why did no one notice I might be a little “too organized” for a child? Truth is parents are busy and distracted, even when their children are hurting. Watching Interrupting Vanessa I cringed a little when Vanessa mimics her mom being too busy to indulge her daughter’s imaginative play. I cringed a lot when Vanessa’s mom calls her treasures, “a pile of junk.” I resolved immediately to lift my head when my children are speaking to me. I will endeavor not to make a fuss over the piles of Legos that cover the floor in my son’s room or the heaps of doll clothes on my daughter’s floor. Vanessa’s room lets us into her mind. Her dad is there, just hanging out, reading the paper, and telling jokes, just as he used to do before he died a year ago. Since that time, Vanessa has withdrawn into the safety of her room and her imagination. Inside her room is everything she needs: costumes and props she uses to embellish her fanciful stories, experiments and inventions, and even a forbidden chocolate cupcake. When Vanessa’s mom invites Timmy Fibbins over for a playdate Vanessa’s comfortable existence is set on edge. Timmy is the awkward kid you remember from your own school days. Today we might wonder if he is on the autism spectrum. I have shared many Childsplay performances with my children. One of the things I like best is that productions are multi-layered. Young children always enjoy the zany antics and colorful costumes of the characters on stage. Depending on age and maturity, some will notice deeper themes. 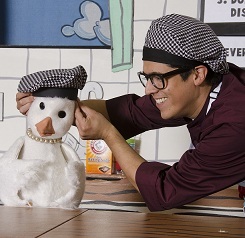 Childsplay productions are always thought provoking for the adults in the audience. Make sure to grab a copy Questions for the Ride Home at the end of the show. This is a great way to help everyone explore the show on a deeper level. Interrupting Vanessa is a short play; running time is less than one hour. Make no mistake there is a lot packed into this show. The talented cast conveys themes of loss, friendship, and being different. As with all productions at Childsplay, there is a short Q&A at the end. Fortunately, for us, the Prop Master and the Director were in the audience providing extra insight into all the components of a successful show. My 11 year old really liked Interrupting Vanessa. He made a beeline for the stage at the end when the audience is welcome up to meet the cast. I looked up to see that he had pulled one of his own treasures out of his pocket to show the cast: a Lego mini-figure. The next time I peer into his room, I will wonder what sort of wondrous world he is imagining in there. by childsplayaz in julie, Rock the Presidents, Uncategorized Tags: "Rock the Presidents"
With Hamilton all the rage on Broadway, and the presidential election less than two weeks away, there was no better time for my family to attend Childsplay’s production of Rock the Presidents at Tempe Center for the Arts. Headed to the theater, I engaged the kids (Landen, 10 and Caroline, 8) with questions such as, “how many presidents has our country had?” “Forty four!” Screams Landen from the back seat. I cheered him on; surprised that he knew the answer, only to later learn that we elected Grover Cleveland twice as our nation’s 22nd and 24th presidents so technically we have only had 43 presidents. Newfound knowledge is just part of what makes Rock the Presidents so fun. The show grabs the audience from the get-go with the lively number Hail! Flashy lights create a rock-concert atmosphere as the cast bounds about on stage in choreographed numbers and acrobatic stunts. There are a few songs devoted to the “lesser-known” presidents such as, Who in the World is Millard Fillmore? The lovely First Ladies is a tribute to our nation’s first partners and it is noted that we may not be far from a First Gentleman. 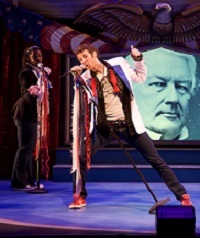 Rock the Presidents has a run time of 1 hour 30 minutes (including 15 minute intermission and Q&A at the end) which makes it perfect for the antsier audience members. 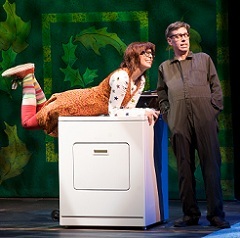 Each act features The Presi-tron, a quiz-show type scene that gets the audience involved by having them answer questions in a physical way, i.e. Shake your arms, wave, fist in the air, etc. I could see my younger child glaring towards her brother for the correct answer before giving hers. I myself glared towards my politically-minded husband for the answers. In our current election climate, it was hard to watch The Buck Stops Here and not wonder if our current nominees would accept the level of responsibility that the lyrics describe. Fortunately, the show quickly takes a fun turn with, They Got a Dog, which highlights presidential pets. Did you know Calvin Coolidge had Pygmy Hippopotamus at the White House? Rock the Presidents keeps the energy up throughout the show. The catchy Ronald Regan is a toe-tapping number prior to the powerful, What Could Have Been? That deals with what happens when an assassin takes a president. The entire show is set against a backdrop of history with images and video on a large screen. Pre-Kennedy assassination images notwithstanding, the most moving images are of depression era America. The Only Things We Have to Fear is a shout out to the optimists that brings the musical back from a darker place. Are You a President-to-be? Ends the show with an uplifting message of hope and speaks of breaking barriers of race and gender. That’s a powerful message for today’s youth and judging by the standing ovation, a much-needed one. During the Q&A (a Chilsplay tradition) my kids were not among those who raised their hands that they wanted to be president but they definitely cast their vote for Rock the Presidents!